Buying a home is not something that people do often and it seems things are always changing: mortgage rates, credit standards, required paperwork/information in order to apply for a mortgage. The process is especially confusing and/or difficult for first time home buyers who have never been through the process before. A lot of potential homebuyers may think they don’t make enough, their credit is not good enough and home buying is too expensive. 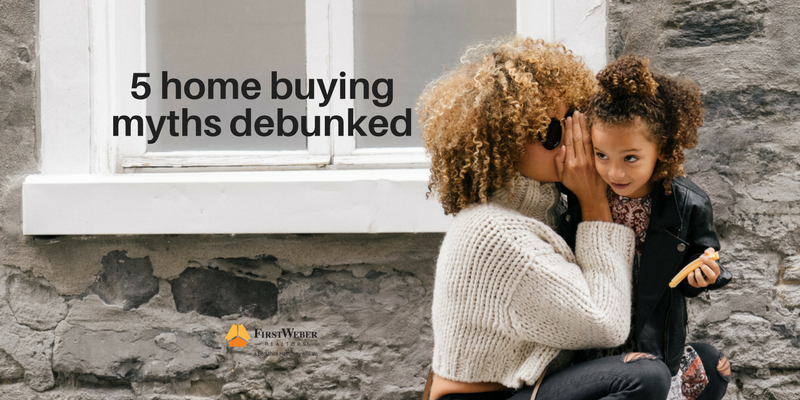 Here are 5 homebuying myths debunked. Talk to the experts who can help the dream of homeownership become a reality, US! That depends on what you are buying, really. You may not be able to afford that dream house right away, but a small condo or starter home can be purchased very affordably. Almost any job, as long as it is stable, can get you on the path to homeownership. We disagree wholeheartedly! Especially for first time home buyers, the guidance that an agent provides can make the difference between owning and not. An agent can also represent you as a buyer’s agent which means they can negotiate for your best interests, give you their opinion on the price of the home, advise you regarding contingencies, strategy and home inspections. There are BIG benefits to using a real estate agent. Well, if it is super low and truly appalling, you will need to do some work on restoring your credit first! A good/perfect credit score certainly helps and may get you a better interest rate, but perfect credit is not necessary and not the only thing considered when determining your eligibility. There are numerous programs in place to help those with less than stellar credit. Talk to a mortgage loan officer about your options. This can certainly vary based on location and style of apartment/home and your individual situation. A luxury apartment downtown on the river would most likely cost more than a smaller condo in the suburbs, just as a lake home or lakefront condo would be more than your typical apartment. You should do some home searches at firstweber.com or other website and use the mortgage calculator to determine your monthly costs based on your wants and needs. There is no hard-fast rule that one is better or more expensive than the other. Traditionally, this has been the case. However, numerous programs have been developed to meet the needs of homebuyers unable to put so much down. Talk to a loan officer about your options. There are even some zero-down plans. Having a mortgage downpayment of less than 20% usually means you will have to carry mortgage insurance which protects the lender. But you can still start your dream of homownership. We’d be more than happy to provide you with access to an experienced loan officer. Just reach out and we can help put homeownership within reach for you. Wisconsin real estate posts record sales and First Weber has best year EVER with $3.5 billion in sales.